კრისტოფერ უოკენი (ინგლ. Christopher Walken, დაბ. 31 მარტი 1943) — ამერიკელი სასცენო და კინო მსახიობი. ცნობილია 100-ზე მეტი კინოროლით და სატელევიზიო შოუებში მონაწილეობით. გარდა ფილმებისა, დრო და დრო მუსიკალურ ვიდეოკლიპებშიც მონაწილეობს (ფეტბოი სლიმი, მადონა, Journey, PIL, Run DMC, The Left Rights). ↑ Reid, Dixie. 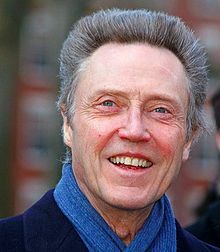 “Bend it like Walken: Actor has more to say about food and hair than acting.“, The Sacramento Bee, October 24, 2004. წაკითხვის თარიღი: October 25, 2008. დაარქივებულია ორიგინალიდან - January 2, 2008.
ეს გვერდი ბოლოს დარედაქტირდა: 09:17, 18 იანვარი 2015.